They were sitting in the backseat of the taxi, tired out after the day long house-warming party they'd just attended. Nina was quiet and Nikhil found it strange. "Hey, all okay?" he asked. Nina simply nodded and continued to stare blankly at the fleeting landscape of towering buildings they passed by. The cab stopped at a traffic light. Nina looked out and the shining lights from a first floor flat caught her eye. The house had an exotic balcony filled with beautiful plants, glowing with fairy lights. There seemed to be some kind of party on. She could see the silhouette of people moving about behind gauzy curtains. The taxi started and Nina let out a little sigh. Now, Nikhil was really worried. "Babe, what's it? What's wrong? Why so quiet?" Nina decided to open up and tell Nik what was bothering her. "Nikhil, it's been twelve years since we got married. Neel is ten and Varun eight. You've stopped having those blasted transfers. We've shifted nine houses in these years. I've seen neighbors not warming up to us, right after we tell them we've moved in on rent. I am so tired of drifting around, not belonging to any place. I want to stop worrying whether we can drill nails on the wall or keep wishing we could have the walls painted before the festive season. You know how much I love decorating the house, but in a rented place, it all seems futile. Don't you think it's time we laid anchor? Change from a rented HOUSE to our own DREAM HOME?" Nikhil's brows furrowed in worry as he realized Nina was genuinely upset. Many of his friends had settled down in their own homes years back while he was shunting about due to job transfers. He hadn't told Nina that he'd been secretly researching the real estate scenario, ever since he'd had a permanent posting. But the homes available seemed either too small, too far away or way beyond their budget. It seemed like they were destined to live in rented houses all their lives. The cab dropped them off and the couple made their way to the flat, each wrapped in his own thoughts. A week later, while browsing the net, an ad caught Nikhil's eye. He couldn't believe his eyes! He couldn't wait to share his excitement with Nina. "Hey, Nina, come here quickly will you?" Nina came around to see a visibly thrilled Nikhil pointing to his laptop screen. As Nina went through what Nik showed her, she couldn't help screaming out, "Oh my God, oh my God!!! This is too, too, too good! We can do this, right, right Nik?" "Yes, yes we can baby! I am confident we can easily afford this and the options are so good. Great construction, wonderful locations and best of all, it comes from such a trust-worthy name! I don't think we can get a better deal than this!" Nina was practically dancing with joy. "Can you imagine Nik, how cool it would be to live in our own home? Not have a nagging landlord, or an indifferent one...no landlord! Woohoo! My own home, to do what I please with it! Can we please have lavender for our bedroom and turquoise for the boys? And lots and lots of plants, wind-chimes in the balcony, furniture from that darling online website I've been eyeing forever, a beautiful pooja-corner and, and....oh, there are so many things I've been dreaming of for my own sweet home! I think we should go in for a 3BHK, that would be so much better when parents come over, don't you think?" Nina simply couldn't hold still and eagerly went to inform the boys. Nikhil in the meanwhile registered himself on the website. He couldn't help smiling from ear-to-ear; they would finally be having their own dream home. He went to join Nina and the kids as they all rushed to hug him. Hooray, dream home, here we come! Now, dear friends, is your story somewhat similar to Nina and Nikhil's? Are you dreaming of a home of your own but too traumatized by the heavy down payment, EMI's, escalating property costs, wary of big promises and under-quality construction by unreliable builders? Don't you wish you could get your dream home, just the way Nina and Nikhil did? Aren't you simply dying to know what magical site Nikhil visited? I won't hold up the suspense any longer! From a brand name that has been trusted across generations, here comes an unbeatable offer! Tata Value Homes has come up with its #TATA99HomesFestival as the answer to your prayers! *Discounts vary from property to property across TataValueHomes properties. Now if that isn't a jaw-dropping offer, I don't know what is! You know what makes this offer unique? Where else will you get upto 99% funding for buying a home? You need to shell out just a teensy percentage of project cost as down payment and voila, you are sorted. Their hassle-free, customer friendly options, loan procedures and great discounts will be a blessing to home-buyers. Homes in great locations, that come with the strong credibility of the TATA group with respect to construction and quality amenities. Even if you are an existing home-owner, this opportunity makes perfect sense for you to invest money in considering escalating property rates, and watch your investment appreciate exponentially. Affordability, Minimum Down payment, Maximum Funding, Hassle-free procedures, Quality Construction, Great Amenities, Value for Money and the Trust-worthy Guarantee of the TATA group of companies. THAT dear folks, sounds like an exceptionally unbeatable offer! If you want to move into that dream home, you've been putting on hold for so long, don't wait any longer. 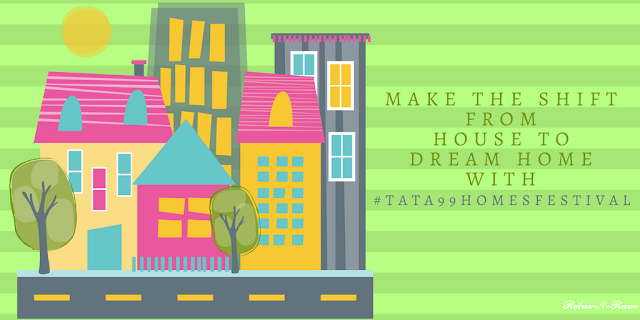 Register yourself at http://bit.ly/TATA99HomesFestivalBC and watch your dreams come true! !